Dear our guests. Thank you for visiting us! In the followings you will see the main points of our hostel. For making your choice easy we are reflecting both our strongest points and also the disadvanteges of our hostel as well. All the rooms are exempt of the noises of the streets. They are with gardenview and ideal for a pleasant relaxing or sleeping after a long hard day. The rooms are protected with soundproof doors from the noises of the inside life of the hostel. We would also highlight that- due to the special location- the rooms are not warming up quickly in the summer- and provide ideal circumstances for sleeping. The rooms are all equiped with the followings: Private shower+washsink, free and fast internet connection, wifi, safe, lockers, cosmetic mirrors, tabledesk, TV with 60 channels, computer, reading lights per each bed, fans. The best partyplaces and clubs of Budapest are just a few steps away from the hostel. Many restaurants, pubs, cafes and clubs are within walking distance so everyone can easily find a cool place to have fun. Going home from a tiring party is not a problem as the hostel is near to the clubs. The cleanliness is very important to us. The cleaning work is made by professional cleaning company everyday from 10:00 till 13:00 in the whole hostel. - who would like to spend a couple of days in a comfortable accomodation in the citycenter with a happy, friendly atmosphere. Friendcompanies, worldtravellers and families are all welcomed by us. - who are sensitive on good foods and comformity. For people who expressivly would like to use the hostel as a club or partyplace we can not recommend it as we are not partyhostel although partygoers are allowed and warmly welcomed. Our rooms: Our quarters maximum capacity is 35-38 people. Our guests can choose from one 2 beded room until 6 beded. Facilities that Belong to our rooms: Private bathroom with own shower, Free Wifi, own computer, TV with 39 channel (including FREE HBO), big cosmetic desk, writing-table+chairs, couch, blower, reading-lamp, lockup safes and wardrobes. Hoping to seeing you soon! Walk 100m toward Astria and you find street Semmelweis. 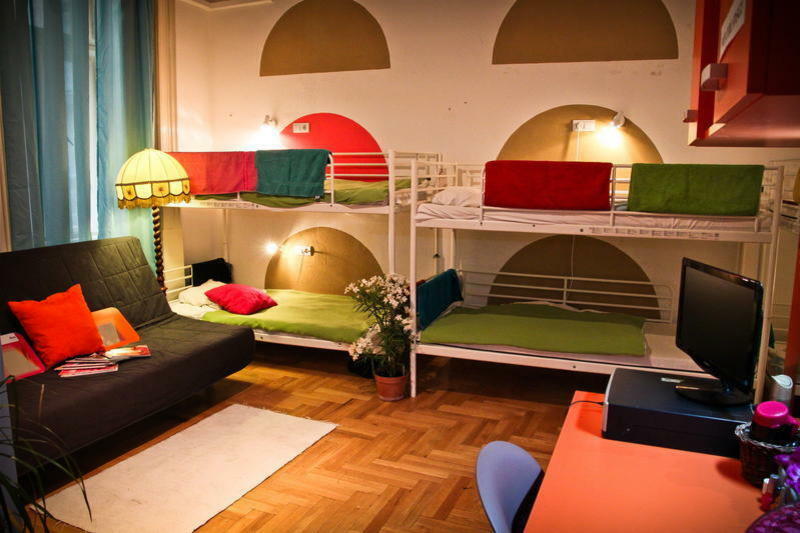 Our hostel is located int he historical protected zone of Budapest so you can not come in with car.